In its historical usage, the word tripping and its root trip (v.) meant “to tread or step lightly or nimbly”. Originally a word from Old French treper meaning “to strike (the ground) with the foot in sign of joy or impatience, to leap, dance, also to trample or strike with the feet”, this usage and meaning has been cited in various works of literature from Chaucer in the 1300s (trippe) to its more modern spelling in Shakespeare around the 1600s, and all the way through the 1800s. Aside from the spelling and semantic change between the modern form of the word, the pronunciation was different as well. In Middle English, words that had a final “e” were not pronounced silently as they are now, but with a high back unrounded vowel /ɪ/ feature. Therefore, trippe back in the 1300s would not have been pronounced as [trɪp] but as [trɪpɪ]. Nevertheless, by the 1800s, tripping would evolve into its modern definition “to stumble or fall suddenly” and later into its other slang usage as “to experience hallucinations induced by drugs” as well. While there is evidence that the former, more common definition was used in Shakespeare’s time (an example of this is in King Lear with the spelling tript: “I beat thee, and tript vp thy heeles.”), this new semantic meaning was pervasive through English literature by this time. It was also by this time that variants of the spelling of trip (tryp, tript, trypte, tryppe) seemed to normalize to its modern form trip, too. Throughout the 1960s and into the 1980s and modern day, however, the word tripping came into a completely different use compared to its previous “stumble” definition. By the 1960s, news reports from the Time, the Daily Telegraph, and the Globe & Mail (Toronto) would be cited using the latter definition of tripping: “He was asked if he took LSD, and answered: ‘I have been tripping for three weeks. (1969)”. In addition to the common meaning of suddenly stumbling or falling, the meaning of being able to suddenly enter into an altered state of mind seemed to be accepted into common usage. In addition, beginning in the 1980s till now, the usage of tripping was extended from the realm of drugs to the culture of Hip Hop to mean someone who was acting “agitated”, “mistaken”, or “outright lying”. In addition to the new usage and meaning, Hip Hop music ushered in a consonant deletion of the trailing ‘g’ in tripping to trippin, altering the pronunciation from [trɪpɪŋ] to [trɪpɪn], in addition to allowing a drop in the verb “is” or “are”. 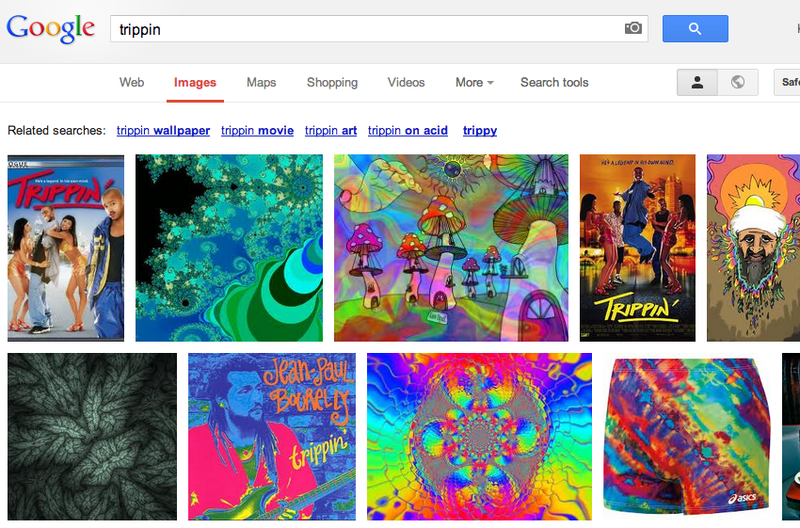 In either case, it is with this current usage of the word tripping in music, films, news outlets, and online media that the term has gone from a meaning of “dance”, to being on an altered state of consciousness, to now being referenced when someone who is wrong: “Wow, you trippin’ right now. 1 + 1 does not equal 3”. “trip, v.”. OED Online. September 2012. Oxford University Press. 30 November 2012. <http://oed.com/view/Entry/206235>. Urban Dictionary: Tripping. Urban Dictionary. 30 November 2012.